In 1660, lower Manhattan was much smaller. 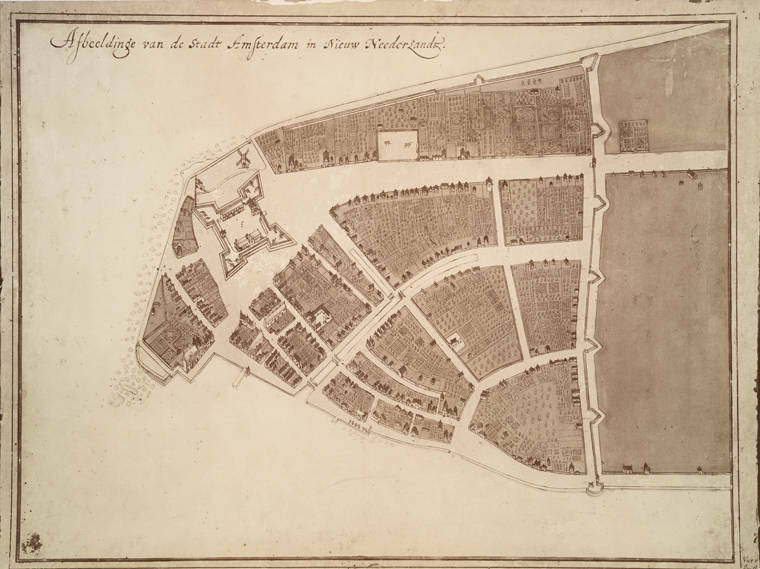 It was called New Amsterdam, Wall Street had a wall, and Water Street was on the water. The tide gauge at lower Manhattan is placed on fill dirt, and is probably sinking into the water. So, Hansen was correct, he just had the wrong century? A prophet in reverse, he is. Reverse Prophet as in what he fortells is what doesn’t happen. For that much land to be exposed in such a short period of time (only 350 years) the sea levels must be dropping at a seriously alarming rate. Why hasn’t anyone noticed? Why the silence? Who is doing something about this catastrophe? If the sea level keeps dropping at this rate – there will be disastrous consequences — least of which will be millions of climate refugees who no longer have sea frontages or places to moor their yachts. You know, when you put stuff in water it raises the sea level. Just get into a bathtub for example. NYC has a lot of added fill real estate around the city. Now extrapolate that everywhere around the globe. Clearly sea-level rise *is* partially man-made, it has to be, volume displacement is a law of nature! Couple this effect with the natural growth of new islands squirting out from the mantle also displacing water, more sea-level rise. How exactly could sea-level not be rising is a better question. So… how much have the sea levels actually FALLEN in last 350 years? Based on this, you’d have to say quite a few feet! I don’t think they have fallen. The new areas are built on fill dirt. How can we be sure? My model says that sea-levels are falling! What? James Hansen’s apologist didn’t perk up yet?